During the summer, many parents send their kids to day camp while mom and dad are at work. Though many children love the experience and look forward to it, not all do. Here are some common reasons why some kids don’t want to go to camp and what to do about it. Talk to your children about how they’re feeling, empathize with them and let them know what they have to look forward to. You can then set up a play date before camp begins. Try sending them to the same camp as a friend. If that’s not a possibility, reach out to the camp’s directors who may be able to put you in touch with other campers. Maybe somebody said something your kid didn’t like, or perhaps your child was unhappy with yesterday’s activities. Asking your kid questions or talking to a counselor can give you an idea of what’s up. Sometimes kids want to spend more time with their parents. If it’s possible, try picking them up early once in a while, or consider taking a Friday off to spend together as a family. If your child is adamant about not liking day camp, consider enrolling them in one that specializes in their favorite hobbies or interests. What does the eco button in my car do? Is my dog or cat overweight? Equipment operators play a vital role in the farming industry. They operate and maintain the equipment used in virtually every stage of modern agricultural production, from the combines used to harvest crops to the loading machines that prepare them for market. Agricultural equipment operators work with all kinds of farming machinery including tractors, raking equipment, berry pickers, threshers and hay balers. Their important work is essential for tilling soil, planting seeds, fertilizing plants and harvesting crops. Working with heavy-duty farm equipment requires a unique skillset and specialized training. To be a successful farm machinery operator, you need to have excellent physical coordination and driving skills as well as mechanical aptitude and the ability to make decisions quickly. In short, you need to be good with machines and good with your hands. You should also love spending time outdoors. According to the U.S. Bureau of Labor Statistics, the average wage for an agricultural equipment operator is $15.12 an hour. If you think you have what it takes to become a farm equipment operator, there are certification programs available that combine classroom instruction with hands-on experience. In these courses, you’ll acquire a thorough knowledge of how various machines work and learn safe operating and maintenance techniques along with tips for how to maximize machine productivity. Becoming a certified farm equipment operator can improve your chances of landing a job at a competitive salary. Deservedly number one on the list, this comedy duo made their love for cannabis the hub of many of their celebrated stand-up routines, studio recordings and feature films during the 1970s and 1980s. Reggae musician Bob Marley publicly smoked marijuana and wrote many songs about it. As a member of the Rastafari religion, he saw smoking ganja as a sacred act that brings spiritual enlightenment. This 1982 coming-of-age comedy featuring Sean Penn as Jeff Spicoli, a perpetually stoned surfer, has become a cannabis culture classic. This Showtime series starring Mary-Louise Parker as a weed-dealing soccer mom ran for eight seasons and received rave reviews for its darkly comic take on American suburbia. This 2008 stoner comedy follows the antics of a processer server and his weed dealer after they witness a murder and flee to escape a drug lord. Pineapple Express is the name of a cannabis strain, but it’s unclear which came first — the movie or the strain. For golf lovers, spring is synonymous with swing. As soon as the snow has melted, they’re reaching for their clubs. However, before teeing off, golfers need to get back their groove. Prior to heading onto the links this season, make sure you properly stretch, check your equipment and get some practice in. Most people become less active during winter. Any return to athletic activity after a lull needs to be done gradually and should involve stretching. Even if you were active last winter, stretching remains imperative: given that your muscles haven’t executed the specific motions involved in the golf swing for months, they can injure easily if not properly stretched. The most important areas to stretch are the wrists, fore¬arms, triceps, shoulders, neck, lower back, glutes and hamstrings. As for pre-season exercise, Golf Digest stresses the importance of strengthening your glutes. These large muscles not only stabilize your golf posture but also protect the lumbar spine from the stress involved in swinging a golf club repetitively. Some exercises that help train your glutes are squats, glute bridges and deadlifts. Golf might well involve more equipment than any other sport. Before starting your season, you’ll want to make sure your gear is up to snuff. Inspect your clubs, grips, shoes and the individual cleats on your shoes to make sure everything is course-ready. Additionally, ensure you have what you need in the way of golf apparel. If you’re looking to hit the links straightaway, make sure you have clothing designed for nippy spring weather. Finally, make certain your golf bag is well stocked. That means balls, tees, markers, an emergency kit and the rest. Don’t expect to be at the top of your game right from the get-go. Before heading out on the course, you’re going to want to visit the driving range. It may be tempting to unsheathe that driver and start letting them fly; however, the best method is always to start with the wedges and work your way up to the big guns. Having done all this, you should be back in the swing of things and ready to venture out onto the tee box. Since 2004, the U.S. government has recognized April as National Financial Literacy Month, a time for encouraging Americans to learn about financial issues and develop healthy spending and saving habits. Studies show that it’s becoming increasingly difficult for Americans to put part of their income into savings. People of all ages aren’t saving enough money to retire comfortably, and numerous surveys reveal that most Americans would struggle to produce an extra $1,000 in an emergency. Plus, the average American household has just over $6,000 in credit card debt. In light of these troubling statistics, it’s important to take steps to promote financial literacy in our families, schools and workplaces. Here are some personal finance basics to remember. • Build an emergency fund. Experts advise having six months’ worth of expenses saved in case of an unexpected job loss or sudden medical emergency. • Use credit cards responsibly. Avoid making only the minimum payment on your credit card each month. Try to spend only what you can afford to pay off. • Co-manage money wisely. Whether you have joint accounts or manage your money separately, have open and honest conversations with your partner about money to ensure you’re on track to meet your long-term goals. • Save 20 percent of your income. Automate payments into your savings account so you’re putting aside the recommended portion of your income each month. Keep in mind that the best way to become financially literate is by developing good money habits early in life. If you’re a parent, consider kid-friendly ways to introduce your children to personal finance this April. Many new cars have a feature known as eco mode that allows drivers to increase their vehicle’s fuel efficiency. Eco mode is engaged by pressing the button labeled “eco” or “econ,” which is typically found on the car’s central panel among the controls for the air conditioning, heat and radio. So, what exactly does eco mode do? It varies somewhat between makes and models, but generally the principal action is to reduce the vehicle’s throttle response (i.e. stifle its acceleration). Often this translates into a stiffer feel in the pedal. Note that the eco mode function is automatically disabled when the vehicle travels at high speeds so that the driver can make safe passing and merging maneuvers. Additionally, eco mode can enable various other tweaks to a car’s operations to increase fuel economy, whether it’s dialing back the air conditioning, executing transmission upshifts sooner or shutting off the engine when the vehicle is stopped. So, if you want to save money on gas and reduce your tailpipe emissions, know that if you have eco mode, you can do it with the press of a button. 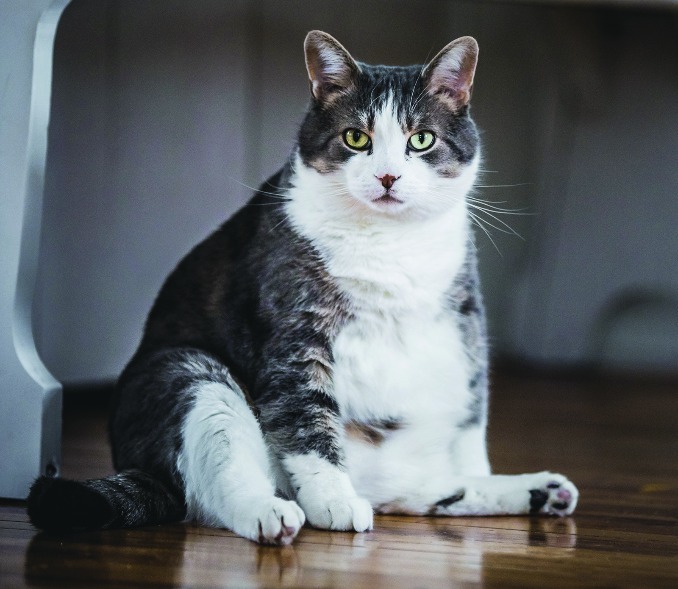 Many house pets in North America are overweight or obese, usually because they get too many treats and not enough exercise. However, extra weight can lead to serious health problems for your pet, including osteoarthritis, diabetes and heart and respiratory issues. If you’re not sure if your pet is overweight, you can easily check if you know what to look for when you examine them. Healthy dogs and cats have a waist between their ribcage and hind legs that you can see when standing over them, and their belly should tuck in toward their hind legs. When you run your hands down your pet’s sides and back, you should feel their ribs and spine through a thin layer of fat. If your pet’s overweight, talk to your vet about how to help them get to a healthy weight for their size and breed. This typically includes feeding them only the recommended amount of food, cutting down on treats and table scraps and making sure they get enough exercise. Just like humans, cats and dogs need to move to lose weight, so make sure to take your dog for long, regular walks, and play with your cat to raise it’s heart rate. A pet at a healthy weight will live a longer, healthier life than one that’s overweight, so make sure your furriest family members stay in shape.